Ever came across an idea that is overly simple and yet it makes so much sense? You’re probably torn between beating yourself up for not coming up with the concept in the first place and wondering why others have not thought of it as well. This is a very common scenario on the internet. These days, an overnight global success has become an all too real possibility and is no longer regarded as a delusion of grandeur. Most often than not the guys who came up with some out of the box concept rake in ludicrous amount of money. But the great news is the big sharks and the small guppies in the online business industry practically work on an even plane. Needless to say, in the virtual marketplace, it’s constant mad dash to the top. And up to this day, it’s still anybody’s game. If you have been on the web long enough, you probably also want to cash in on those lucrative online opportunities, right? If you want to carve a market niche for yourself or penetrate a certain industry, it’s always good to make a calculated risk rather than leaving it all to chance and hoping for a positive outcome. No, you certainly don’t want to start that way. Well, there is a new product that may just be the right solution to jumpstart your online success. Cogzidel has recently launched “SEPT“, a Free Groupon clone script which basically allows you to set up your very own daily deals website like Groupon within the next 24 hours from download. It’s a simple yet very powerful tool to monetize your online site. Cogzidel is working on the premium elite group buying scripts which are in the pipeline. 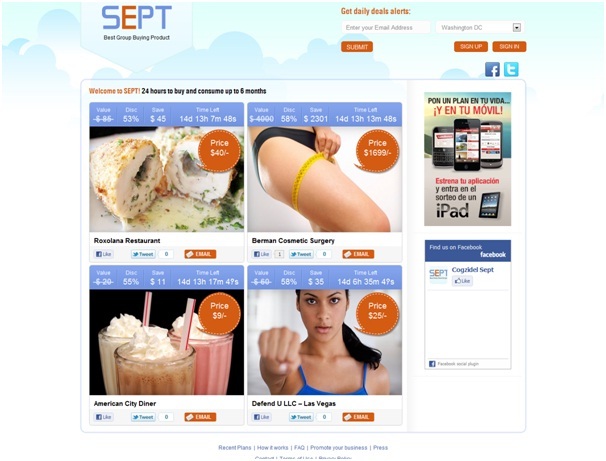 SEPT is a community buying portal designed similar to Groupon.com. Its business concept is actually very simple yet has been proven to be highly profitable. You have probably heard about the phenomenal success of Groupon, as it is widely popular all over the world. Groupon introduced the innovative concept of online group buying, which is now widely recognized as one of the most exceptional business strategies ever to the introduced in the E-commerce world. Following the same business model, by running SEPT on your website, you can offer your visitors highly attractive discounts on daily deals from the local merchants operating in your region. These deals are emailed to your registered subscribers on a daily basis. So basically, the big idea behind SEPT is to attract and draw in a large group of online consumers by offering great discounts on specific items that are in demand.Deep discounts offered can range from places to stay, entertainment, consumer products, food and diningand so much more. This concept is both beneficial for buyers as well as the sellers since there are also a required maximum number of people that need to register to a certain deal before the whole group the avail of the said discount. This means, if a certain seller offers a significant discount to a large number of consumers, it will not make a major dent on the seller’s profit margin since they are assured of X number of buyers who will avail of their products and/or services. How can a small Guppy compete with the big Sharks? For any startup company, one of the major concerns is how to compete with the big guys who have already established their presence and dominance in the industry. One of the wonderful advantages of the group buying concept is the fact that you don’t really need to compete with the big sharks here. Your main focus can just be your local market and simply tap on the city, town or region’s buying and selling power. However, it is still important to be among the first ones to offer this service in your area to gain more market clout. So if you want to ride the wave of this global trend, make sure you position yourself ahead of the game. Get started now before someone beats you to it.